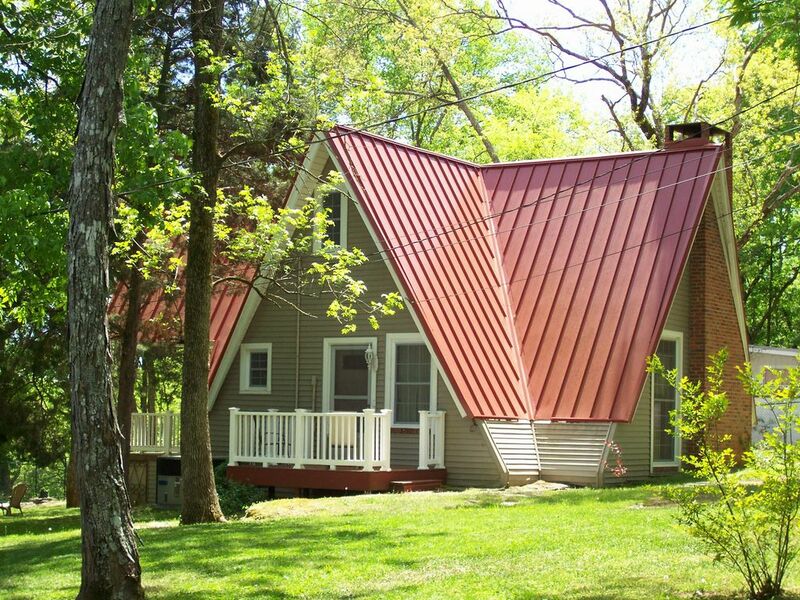 Wonderful Lake Cabin 2BR 2BA (Sleeps 8). Watch as moonbeams dance like diamonds on the lake at this A-Frame Cabin located directly on Old Hickory Lake. Two bedrooms upstairs, two full baths, two sofa sleepers downstairs, large stone wood burning fireplace stretches to the peak of the cathedral ceiling, spiral staircase, kitchen fully stocked with cooking and eating utensils, lots of eating and serving space. Linens are furnished. Come float on the water, swim, fish or just sit on the porch and enjoy nature. Deer, wild turkey, peacocks and geese will amuse the early risers. Birdwatchers are in for a treat. Frisky squirrels jockey for your attention - they love peanuts! How long has it been since you snuggled in a hammock? Perfect for the boater or fisherman. Cable TV provided for those who enjoy the indoors. Come and read a book by the fireplace. Convenient to I-40. Amenities: Refrigerator, Stove, Oven, Coffee Maker, Toaster, Microwave, Television, Cable, DVD/CD Player, VCR, Radio, Central Heat & Air, Linens, Charcoal Grill. Bring extra towels in the summer - you're going to want to get wet! Nashville International Airport - 20 miles. The Slayden Cabin has a Air Hockey table. The charm of Slayden can’t be beat. Accommodations were comfortable, the cabin is well stocked and Steve could not have been more helpful or kind. My children loved the paddle boat and caught their very first fish! It was a wonderful, relaxing weekend with family. Plenty to do in town, too! We stayed at the Slayden house for a getaway with the kids for Spring Break. It was the perfect location, semi-private lake view with access to enjoy the beautiful Old Hickory Lake but also just outside Nashville if you want to explore what the city has to offer. The lake house had everything that we needed to enjoy our stay. Steve was a great host. The kids wanted to try out the paddle boats but I forgot to bring life jackets. Steve not only provided some to us but also went down to the lake to make sure the boats were ready to go out. We were really pleased with our stay at the Slayden house and would recommend it to anyone looking to visit Nashville but also wants to stay away from all the busy-ness of a big city. Steve was a great host and helped us find everything we needed. He even brought us firewood and helped us start the fire. Peaceful setting. We very much recommend the Slayden house! Thank you for taking the time to write a review!! We love living with the cabins so we can help if needed. Starting fires, showing closest stores. We really enjoyed having you and hope to see you again soon. Perfect!! Great host. Very relaxing and clean. I will recommend it to all my friends in Florida. From the moment we walked into this chalet, we were awestruck. My girlfriend & I were celebrating 50 years of friendship this week. We met freshman year in high school & still BFFs to this day. There wasn't one thing we didn't like about this chalet. So much is provided above & beyond what the amenities state, Steve is a great fountain of knowledge. I am a clean freak, & this place was true to my standards. Definately, book your next getaway at this chalet....wild turkeys in area, the atmosphere is so relaxing & the hammock is great!!! We stayed at the Slayden house for 5 days and truly enjoyed it. The house has a lot of character and is very comfortable, we especially enjoyed the back porch and the air conditioning worked very well. In addition, all of the appliances worked perfectly with all the needed tableware and utensils. The house is extremely clean. We spent time on the water (rented a boat), in Nashville and exploring the area. The area is a rural setting with all amenities nearby. There’s a great coffee shop in Lebanon. Close enough to Nashville for a day trip using primarily the interstate to go back and forth. We also spent time fishing down by the dock in the mornings and evenings, it is a very private, peaceful area with very little boat traffic and the stars are amazing. Steve is a wealth of knowledge and can help you with planning your time there. We’re hoping to stay there again soon. Only 25 Miles to Nashville. Unique, quiet, comfortable get away. Easy access to I-40 and Nashville. $ 840.00 including taxes 7 nights/ 8 days -All cabins have check in 3:30 pm check out 7:00 pm $ 780.00 including taxes 6 nights/ 7 days $ 685.00 including taxes 5 nights/ 6 days $ 590.00 including taxes 4 nights/ 5 days $ 495.00 including taxes 3 nights/ 4 days $ 400.00 including taxes 2 nights/ 3 days All cabins have an $175.00 refundable cleaning/damage deposit Arrival & departure days can be flexible. $175 Refundable Security Deposit Required Upon Arrival.